History has often been referred to as "his story." In other words it is the story of what occurred in the past based on the perspective of the presenter. Each cultural group will tell its story based on its perspective. The African American culture is rich with history and our story demonstrates our patriotism, commitment and love for this great nation. Who better to tell the history of African Americans than African Americans themselves? 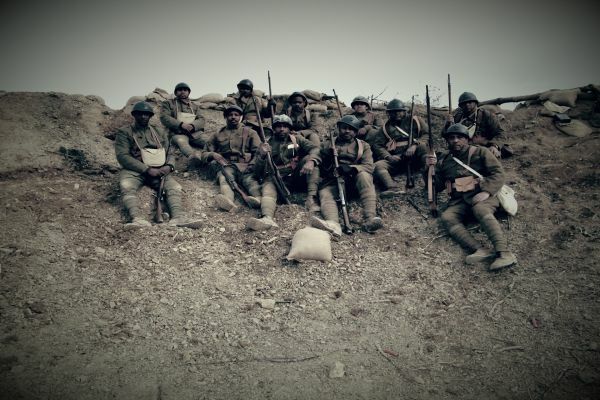 Ebony Doughboys are a group of African American living historians who are focused on telling the story of the outstanding record of service of African Americans during the First World War. Founded in 2014, we are the offshoot of other African American reenactors who for many years educated and enlightened the public on the involvement of African Americans in WWI. We form an overarching structure for African American reenactors who hail from the east coast, the mid-west and the southern United States. As a basis of our historical interpretation, we engage in the extensive research of the role of African Americans during this period by studying and reading personal accounts, archived sources, photographs and other source material. We examine photographs and original garments, accoutrements and weapons to gain a thorough understanding of the original Ebony Doughboys. We strive to reach a consistent, high level of authenticity in our appearance, realizing that as our knowledge grows, our standards for authenticity will also evolve. Members are expected to present themselves to the public with military deportment, an open-mindedness for learning, and a commitment to educating, dispelling myths, and building bridges of understanding.